ALL memories are stored forever in the subconscious mind! DID YOU KNOW THAT YOU NEVER FORGET ANYTHING? Hypnosis used to improve one’s memory is an extremely effective therapy that includes learned behaviors and reorganizing the material stored in the brain so the garbage doesn’t get in the way of important facts. To understand how hypnosis can improve memory, it helps to understand how the brain receives and stores information, then recalls that information on demand. The brain receives literally millions of signals a day, most of them simultaneously. There are sights, sounds, smells, and feelings that are absorbed, but few of them are consciously registered. All of the senses in fact come into play as the brain is receiving bits of information. Much of this information is not considered useful at the moment, if ever, and is quickly and automatically pushed to the background. The Improve Your Memory Hypnosis MP3 works to improve memory by doing a housekeeping task of sorting and categorizing information. It does this through first relaxing the body and mind. Then like a virtual organizer data is sorted into different regions of the brain. When the clutter is removed and the dust wiped away, then the important thoughts we wish to remember can be recalled quickly. Remember the expression, “I’ll have to sleep on it?” It is used when a big and important decision needs to be made. This isn’t just an act of buying time before making a decision, but a scientifically studied process of the brain. When the mind is in a relaxed state of sleep it is then able to sort through stimuli and data received throughout the day and organize it. Hypnosis works in the same way to improve memory. Through the skilled guidance of Clinical Hypnotherapist, Steve G. Jones, listeners of his Improve Your Memory Hypnosis MP3 audio can get their minds to relax so important information can be recalled when needed. It will train you to consciously make note of that you will need to remember later. These are the skills that can help with test taking, business and personal relationships, and getting the most out of all you learn. Hypnosis can help you access those memories more easily…and the effects last beyond the hypnosis session…you will have a better memory permanently. Steve G. Jones, Ed.D., Clinical Hypnotherapist, charges $1,500 for a custom recording and $25,000 for a one-hour private hypnotherapy session at his office. But you can get all the benefits for this low price. 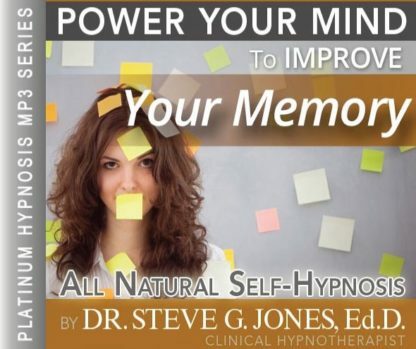 Simply listen to the Improve Your Memory Hypnosis MP3 session every night as you go to bed for three weeks and feel the changes happening in your life. You will feel more empowered, more in touch with your true self, and you will truly know that your goals are within your reach. As we grow older, our brains ability to store, retain, and retrieve information begins to decrease. Throughout our life we must exercise our brain in order to keep it focused and sharp. By exercise, I mean memorizing, performing simple and complex tasks, and brain teasers. Research has also shown that getting more oxygen to the brain can improve memory. This can be accomplished by physical activity. Physical exercise can increase the supply of oxygen to the brain and thus improve your ability to concentrate and it can also improve short-term memory. Everyone can agree that age has an effect on our memory. There are other factors that cause some people to accelerate the loss of memory, but it is good to know that we can all do something about it. Working on our memorization skills by remembering something instead of writing it down, can help your brain. Doing brain teasers to give your brain a mental workout has shown to help and physical activity can also improve memory. As you drift along deeper and deeper, relaxed, concentrating. Your mind relaxes more and more. You are concentrating on my voice. You are receptive to my suggestions about your memory and your ability to recall. The art of memory is the art of attention and retention. You must pay attention to anything in order to remember it. People who do not pay attention, do not remember. To remember something, you must pay attention. For instance, you think of the name, you look at the person, you associate them, you want ot know the persons name, you really want to remember. This is the process that you use to remember anything. You concentrate your mind. You think. You look. You listen. You associate. You remember and you do all of this easily and effortlessly. In being able to recall something, you have to have stored the information properly. You have to put the facts in your memory bank before you can recall them. You have an excellent memory. You are going to use it. You are going to pay attention. You must pay attention, close attention, that way you store the facts properly in your memory bank and they are ready for you when you want or need them. From this moment on, everyday you utilize your good memory. You use your good memory everyday. You always pay attention. You pay attention to exactly what is going on around you, to exactly what is being said to exactly what you hear, to exactly what you see so that when you need to go into your memory bank, to make a withdrawal you have already deposited something to withdraw. The facts are properly stored and they are ready for you and they are ready for you whenever you want or need them. Your memory bank is just like any other bank. When you go to a bank to withdraw some money, you’re able to do this easily and effortlessly. You fill out a withdrawal slip or write a check and have it cashed. You do the same thing with your memory bank. It is not necessary to force your memory bank to give you the information. You simply concentrate your mind, request the information, relax, and let it drift up to your conscious awareness. You have a good memory. You have an excellent memory. This is true for you. You have an excellent memory. You have an excellent memory. You have an excellent memory and your memory is improving day by day. Your memory is very important for your well-being. It is important to keep it sharp throughout the aging process. As you age, you are going to want to depend on others as little as possible. So by keeping your mind quick, you will contribute positively to your well-being. No matter what age you are, it is always important to work on improving your memory. No one has a perfect memory, whether they are 22 or 96, but you have the ability to improve your ability to remember things. It takes practice and with self-hypnosis it is so easy to have a better memory. This hypnosis program will target your subconscious mind and enable you to remember things. Your brain stores an enormous amount of information and it will always be stored. It is a matter of accessing the information that can be difficult at times. The Better Memory hypnosis recording will allow you to access and retrieve the information you weren’t able to access before. Even if you are young and not worried about losing your memory ability, this hypnotherapy program will help you remember more content. If you are in school and you have to memorize a lot of things, this program will help you to store, access, and retrieve information. If you have lost an item, this program can help you access your memory and find out what happened to the misplaced item. All of your past actions are stored in your brain somewhere. This hypnotherapy program will help you remember where you lost that item. Perhaps you want to become better at remembering people’s names and faces. Hypnotherapy will make your memory sharper and it will give you the ability to remember more people and information than you ever thought possible! With hypnotherapy, there are so many different ways you can improve your memory! We suggest you listen to the Improve Your Memory Hypnosis MP3 recording for 21 nights in a row before going to bed. Some people see results right away. You can continue to improve your memory as long as you continue to listen to the hypnosis session! It is that powerful! This study describes how hypnosis can make it easier for the brain to access the default mode network (DMN) associated with semantic processing (finding meaning), episodic memory [use for memory] and self-awareness (Modulating the Default Mode Network Using Hypnosis).